What a smooth swing Rendon has! Best player on the team. OK, so I added a poll on what his nickname should be. Right now, there are three choices, but please suggest others if your name is not HammondsNats. I saw "Tony Two Bags" last night and would like to give credit. It may sound a little more Jersey than Houston, but i'm thinking Tony from North Jersey would approve (RIP, JG). added. can change vote if you like. He was, is and always will be "Hitman". I don't need no stinkin' poll. How about we just rotate his nickname? I like them all. Mike Easler is the Hitman. Sweet memories for this Bucco fan. Real glad he showed up here. I don’t get it. He’s getting some sleeper love, and frankly it makes little sense to me. He’s slated to hit eighth, which is the worst possible spot to hit in if you’re a National Leaguer and he has seemingly little chance of moving up much given the names ahead of him. He has no speed and shouldn’t be expected to be a major positive contributor to your batting average. So, you’re really hoping he enjoys a power breakout. Heck, he must do so to deliver any value whatsoever, since his runs scored and batted in totals are going to be underwhelming out of that eighth slot. His batted ball distance last year was just about league average, as was his xHR/FB rate. The good news is that suggests a nice spike from what he posted last year. The bad news is that even if he doubles his home run output, or gets into the high teens, that still makes him close to replacement level in mixed leagues. I've kept an eye on him, on and off, this season and, for some reason, he never mentions Anthony Rendon anymore. Tis better to keep your mouth shut and people think you a fool than to open it and remove all doubt. Among the things I learned about Anthony Rendon from this Washington Post article, it's that the young Nationals infielder doesn't seem to like baseball all that much. Rendon, who easily could have made the all-star game but didn't, says he was grateful for the time off. He says he doesn't talk about baseball with his family, never watched the sport growing up, and rarely watches it now. "I don't watch baseball — it's too long and boring," Rendon said. Perhaps Rendon's joking here. But if not, he's not the only one to be bored stiff by the game. Nor would he be the first person to not-so-secretly hate his own job. How many of you know someone—heck, how many of you are someone—who doesn't like what they do but like the paycheck or just aren't particularly good at anything else? If Rendon keeps playing like he's playing, he's allowed to take naps between innings if he wants. I played Volleyball and Tennis growing up and I never watch either on TV. They took one little quote, which was probably made in jest, and made a big deal out of it. Didn't even bother reading the article. Yeah I read the Post article. That's pretty much what they did. Oh, oh. I hope the media doesn't try to paint him as eccentric or something. That crap eating grin doesn't help either. 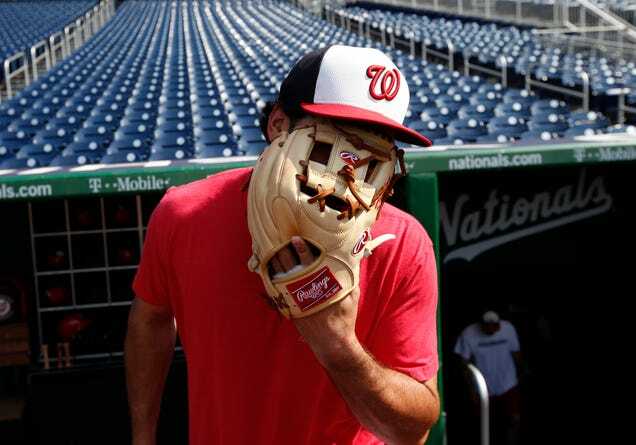 His Glove Face is damned creepy. It's also grinning!